On a photo: Rutile and anhydroferrite from Brazil: crystals decussate under corners, proper the verges of anhydroferrite. Widely widespread in alluvial deposits, usually characterized red, and also golden-yellow and brown colouring. At presence of admixture of iron a color becomes black (nigrine); a presence of niobium and tantalum of condition is black-grey tones. 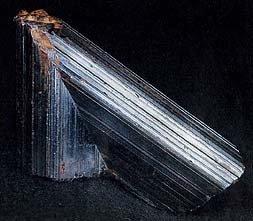 Rutile forms short-prismatic or extended crystals, with the vertical shading; much rarer - pyramidal. Chasty twins, quite often "genicular", that typically exactly for a rutile. If Rutile forms inclusion in a quartz, it acquires the look of long, very thin needles, look like hairs; they are either lines or, more frequent, bent. Their color hesitates from brown-red to yellow, and length exceeds 2-3 sm sometimes. A black, yellowish, or reddish-brown mineral, found in igneous rocks, metamorphosed limestones, and quartz veins. It is a source of titanium. Composition: titanium dioxide. Formula: TiO2. Crystal structure: tetragonal. Via French from German Rutil, from Latin rutilus red, glowing. Chemical composition (chemistry, compound)-maintenance (in %): Ti - 60; About - 40; the admixtures of iron, tin, niobium and tantalum are ordinary. Bitetragonal-bipyramidal group type of symmetry. Cleavage-perfect absolute to on (110), less clear to on (100). Be found as prismatic, columnar, basaltiform, needle-shaped and hair-like, piliform, capillaceous crystals with main simple forms (110), (100), (120), (130), (230), (101), (111) and other Knee twins, branch boxes, reticulated joint, junction of twins of needle-shaped rutile, are characteristic (sagenite). Crystals quite often are bent, have shading along lengthening. Fine small- and coarse-grained continuous the masses are widespread also, where sometimes Rutile associates with quartz and ilmenite. It is now and then transparent and in addition possesses diamond off-gloss; but usually opaque or transparent. 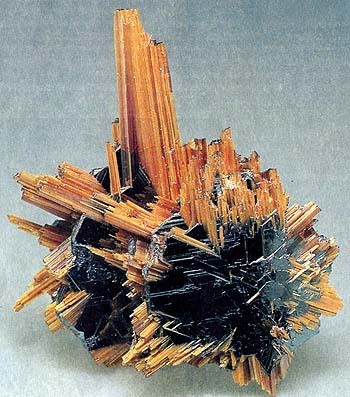 Hard and heavy, Rutile easily divided on cleavage, fragile, not melt fuse and not added the action effects of acids. Easily recognized by a chemical analysis. 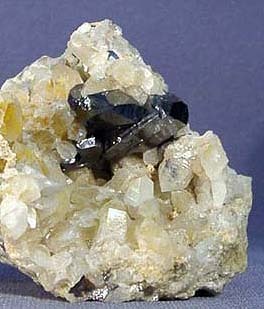 From brookite and octahedrite differentiates on the typiform of crystals. Except for intrusion, irruption (granites, syenite, diorite greenstone) and metamorphic (gneiss, mica slates) rocks, in which Rutile present as accessory mineral, it appears in alpine vein, lode, mines, crystalline dolomites and limestones. But mainly it is widespread in sands, appearing due to destruction of maternal rocks. The best copies, different brilliance and perfect form, act from Greyvs-mauntin (the state is Georgia) and Uayt-mauntinz (state of Californium). In some places in Norway (Kragere) of Rutile a-plenty presented in vein, lode, mines, rich in an apatite. Very clean from the admixtures of Rutile is in some rocks, enriched horny blende in the state of Nativeium (Rouzlend). 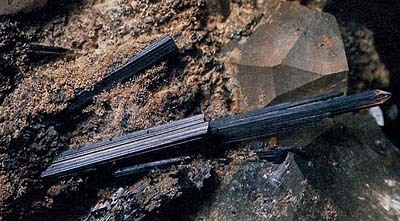 The good crystals of rutile are know the deposits of Binnental and Gavradi in Switzerland (Gridzhioni), where crystals are present as correct accretions with the plates of anhydroferrite. Excellent crystalline formations are known in the vein, lode, mines of white quartz near-by Kastione (Canton of Tichino). In Austria found out good standards in Modriakhe (Shtiriya). The needle-shaped crystals of yellow, included in Quartz, are found in Brazil. Rutile widely widespread and in Italy (EU) - beautiful crystals are found in Alpe-Devero and in the dolomites of Krevalodossole (province of Verbaniya), in the quartzites of Oropa (province of Biella), in Val-Malenko (province of Sondrio) and different places in area of Alto-Adidje. Rutile obtain on the deposits of Norway, Brazil, United States (USA) and Australia. It important industrial ore on titan is a metal, widely in-use for making of special steel and alloys. To the present tense the vast number of synthetic single-crystals is known. The single-crystals of synthetic rutile were got first in 1947 in the USA by firms to Linda Eyr-prodakts and Neyshnl-led-kompani. The last gave the crystals the name "Nightly stone", because cut synthetic Rutile looks especially showily at lamplight. For growing of crystals the method of Verneylya is used. This method presently is basic for the receipt preparation of technical and jeweller rutile. As feed-in material use a titania high degree of cleaning and grinding down. Reared boules have a diameter 15 - 20 mm at length 40 - 50 mm, dark blue to black color and for lighting up need subsequent annealing in the atmosphere of oxygen. The oxidizing annealing at a temperature from 800 to 1300oC causes the step change of color of crystals from black to intense-dark blue, dark blue-green, brown, grey-yellow and, finally, light-yellowму. Delivered from the easy straw-yellow tint of the reared crystals extremely hardness. For the removal of yellow tint in a charge add the oxides of gallium and aluminium. The admixture of beryllia allows to make the crystals of rutile of blue color, but the stone cut from them have a sense to break away on ribs, that prevented the industrial growing of such crystals. A dark blue color is also given the rutile of admixture of tantalum, columbium, molybdenum, tungsten and uranium; red - vanadium, chrome and nickel. The method of receipt preparation of crystals of rutile, possessing asterism is patented in the USA. Such crystals rear also the method of Verneylya, but add to the basic charge (or to double salt of titanium-ammonium sulfate before a calcination) additionally 0,2 - 1% oxides of magnesium. Reared boules of rutile for giving transparency and effect of asterism, related to the fall of crystals the oxide of magnesium, expose to the oxidizing annealing at a temperature 1100 - 1500oC.